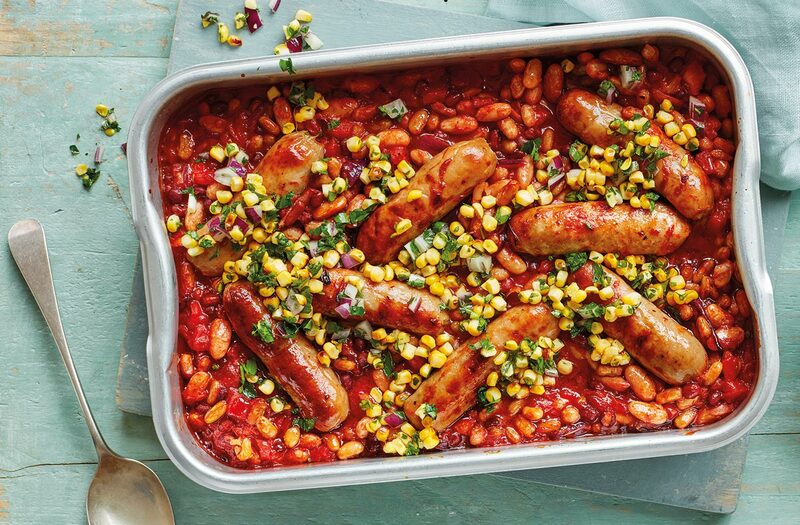 Barbecue sauce is the secret ingredient in this simple traybake – providing a sticky glaze on the sausages and glossy sauce all in one. Served with a fresh charred corn salsa, this is destined to become a family favourite. fan 180°C. Put the oil in a roasting tin and heat in the oven for 10 mins. Add the sausages and sliced onion, toss to coat in the hot oil and roast for 10 mins. Meanwhile, preheat a griddle pan or heavy frying pan. Griddle the corn for 15 mins, turning occasionally, until charred and tender. Remove the kernels carefully by standing the cob firmly on a chopping board and slicing with a sharp knife. 15 mins until the sauce is bubbling and the sausages are cooked through. Meanwhile, make the salsa. In a small bowl, mix the corn, diced red onion and parsley. Serve scattered over the sausages and beans.